STEPHEN Kampyongo has threatened and warned Hakainde Hichilema and Geoffrey Bwalya Mwamba to stay away from Shiwang’andu constituency because the people of the area do not like insults”. And Mr Kampyongo said the Post Newspaper twisted what happened in Shiwang’andu on Monday when Patriotic Front and UPND cadres clashed. Mr Kampyongo has threatened to personally deal with the UPND cadres who were bringing down PF campaign posters if the police could not deal with them. Addressing Patriotic Front (PF) youths at the PF party headquarters in Lusaka yesterday, Mr Kampyongo said the ‘‘stupidity and insults’’ by the UPND provoked his people which saw them clash. Mr Kampyongo wondered why every time the UPND attempted to hold rallies in his constituency there were violence. Mr Kampyongo said whenever other political parties conducted rallies in his constituency there were no incidents of violence except the UPND. Mr Kampyongo, who is Shiwang’andu aspiring candidate on the PF ticket, said it was the UPND cadres who attacked and beat up his party members. “The Post Newspaper twisted what happened in Shiwang’andu,” he said. Mr Kampyongo, who rubbished reports suggesting that his cadres in Shiwang’andu attempted to bring down the helicopter carrying the UPND president Hakainde Hichilema and his entourage, said the UPND cadres provoked PF members. Mr Kampyongo also described the UPND as “umulembwe wachipuba” meaning it was finished because it had been sold to those who had been rejected in the PF. “I cannot fight with HH and GBM because I have no time. That is why I am giving youths loans to start up small businesses on their own than start a fight with the UPND. We don’t want bloodshed in this country,” he said. Responding to reports that HH and GBM would deal with him over what transpired in Shiwang’andu on Monday, Mr Kampyongo urged his cadres to be responsible whenever provoked by the UPND cadres. And Mr Kampyongo challenged the Post Newspaper to tell the nation what President Edgar Lungu had done to them to continue scandalizing his name. 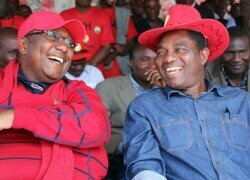 let’s admit violence is between only these two Parties PF and UPND. Why are UNIP, FDD, GREEN PARTY etc are not in the media on violence? please stop abusing our children. Why don’t you include your children in the fracases? Congratulations HH on joining the wife beaters club! You, Scott and Sampa can now compare notes on how to give your wife a good beating because you love her. HH greed for power is obvious! He stabbed a vice who saves lives for a living and replaced him with GBM who favourite pass time is beating his wife Chama. Women should vote to keep GBM otherwise known as Gross BAtterer of mothers out of power in government! Fred Membe be forewarned that you wil be sternly delt with because you are not super human.Don’t think we are happy with stupid publications,don’t think we are docile,continue and you will see.